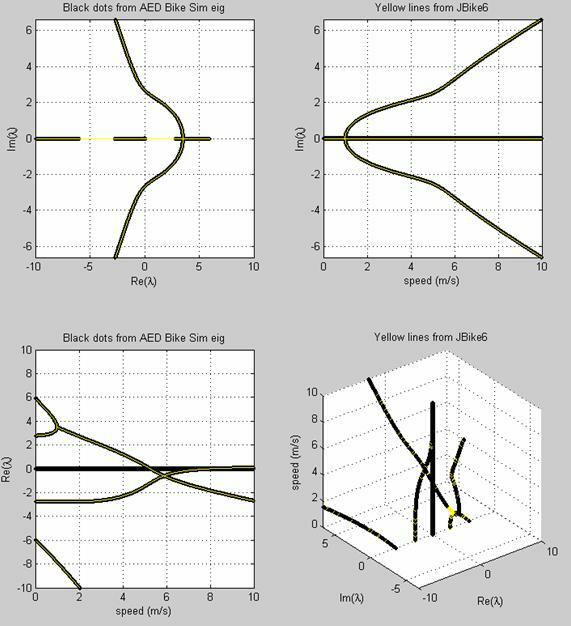 The linearized equations of motion implemented in JBike6 have been exhaustively verified in paper by A. L. Schwab, J. P. Meijaard, and J. M. Papadopoulos. Thus, they serve as an excellent benchmark to verify any other bicycle equations of motion. Here, we show how to do exactly that. 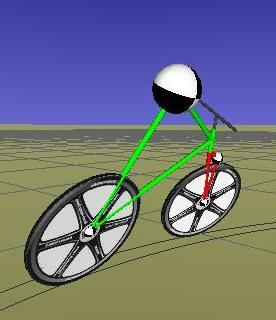 The advent of cheap and plentiful computer power and numerical methods provides the opportunity to simulate bicycle motion from fully non-linear equations. Although systematic methods exist for generating these equations that avoid the complex assumptions and simplification required for linearized equations, the question of their accuracy remains. Fortunately, a way exists to confirm fully non-linear equations: comparison with a known benchmark’s eigenvalues. They are intrinsic to the modeled system and are completely independent of coordinates and units chosen. JBike6 provides these eigenvalues from its linearized equations. Here we show how to extract them from the non-linear equations, and compare the results. · 4 rigid bodies in 3 dimensions all with left-right mass symmetry. · Connected by 3 revolute or pin joints: steering axis and two wheel hubs. · Rider is rigidly attached to the frame (optional front and rear racks also rigidly attached). · No friction at any joint. · Wheels are knife-edged disks with left-right mass symmetry and polar mass symmetry, and they roll without slip or loss due to friction. · Ground is a rigid, flat, horizontal surface. · Only external forces are gravity, the ground reaction. · Always starts in an upright, straight ahead configuration with some given forward velocity. · Two non-holonomic constraints, one at each wheel contact point. 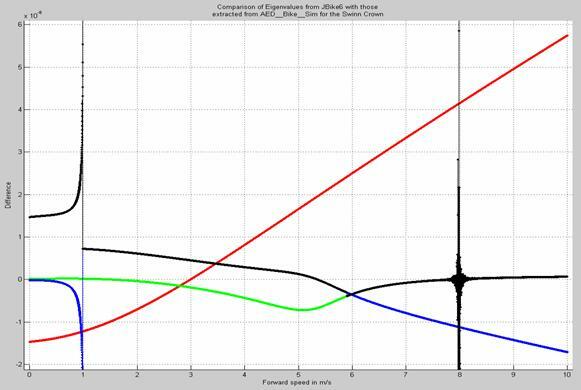 · Wheelbase: distance between wheel-ground contact points. · Steering axis tilt: amount steering axis is tilted from the vertical. · Trial: distance from front wheel ground contact point to point where steering axis intersects the ground. · Forward position of rear wheel. However, the acceleration is taken to be zero to the first order and so the forward velocity is constant. This leaves only two non-trivial degrees of freedom: lean and steer angle. Two coupled second-order ordinary differential equations represent the motion of the system. In the actual derivation for his Masters Thesis, Scott Hand used constrained Lagrange equations and then eliminated the constraints. · Mθ and Mψ are moments (torques) applied at the rear assembly and the steering axis, respectively, and which are both taken to be zero. The four rigid bodies used to model a bicycle (the same as for the linearized model) with the mass and inertia of the rear rack combined with that of the rear frame and the mass and inertia of the front basket combined with that of the front fork. where D is the 'Jacobian' of the velocity constraints and gi are the 'convective' terms, and since I3 is used to represent the 3x3 identity, the body-fixed inertia matrix for body i is written J'i. With numerical integration via RK4, although integration is not used in the calculation of eigenvalues. · Minimize error and smooth results by forcing at least one iteration. Without this technique, error in the position constraints builds over time and then requires a 'jarring' correction that shows up in the running energy calculations. It appears that this technique better keeps the error in position constraints under control so that multiple steps are rarely, if ever, required. · Adjust velocities with Pseudo inverse in one step. Use in both implementations: 'Schwinn Crown'. Units are meters, kilograms, and radians. where M is the mass matrix, C is the damping matrix, K is the stiffness matrix, and D is the differential operator. Note that for the upright bike Cθθ = 0, and so it did not appear above in the equations of motion. Where the values of λ that satisfy the equation are the generalized eigenvalues and the corresponding values of x are the generalized right eigenvectors. 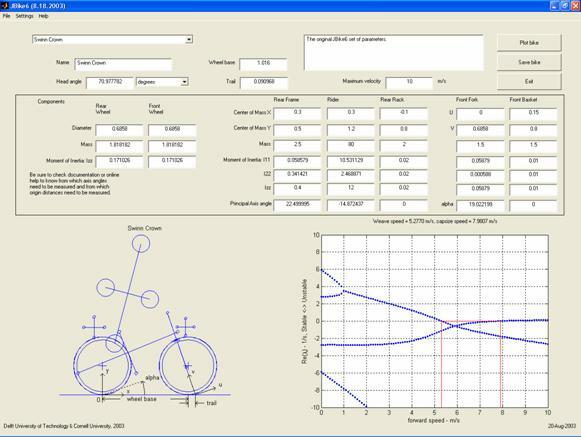 Screen shot of JBike6 program showing the bicycle parameters, a stylized drawing of the bicycle, and the calculated eigenvalues for a range of forward speeds. and assume a solution of the form . Then the eigenvalues, λ, of the matrix [A] describe stability: stable for λ < 0, unstable otherwise. To construct this matrix [A] for a nonlinear system being solved numerically, recognize that the function to compute the accelerations (called by the ode solver, RK4 in this case) has the form . Thus the matrix we seek is merely . However, is not some function that we can simply differentiate symbolically. In order to select the best value for epsilon, we simply iterate until convergence. The value of epsilon for each state variable and forward speed is chosen in a loop in which it is decimated until the resulting candidate values for a column in the matrix converge. The best value turns out to be 1e-11. The eigenvalues of this matrix [A] can be compared to the eigenvalues from the linearized equations. In this particular case, because the non-linear equations use 48 state variables instead of the 4 used in the linearized equations to represent the 2 non-trivial degrees of freedom in the system, 48 values are generated. 4 of them correspond to the 2 non-trivial degrees of freedom in the system, and can be compared to the 4 generated from the linearized equations. The plots below show the excellent match of both real and imaginary parts of eigenvalues from the two methods. The plots below show the difference between just the real parts of the values from the two methods. at 10-5 and only the part of the forward speed range near the capsize speed. Maximum difference between the two methods occurs near the capsize speed (7.9807 m/s), where an eigenvalue crosses the real axis from negative to positive. The difference peaks at just under 1.5e-05. Another, smaller increase in error occurs just before (forward speeds < 1 m/s) a double root: a bifurcation where two eigenvalues with different real parts and zero imaginary parts approach the same value and then (for higher forward speeds) have the same real parts and complimentary imaginary parts. There the difference peaks at just over 1e-07. 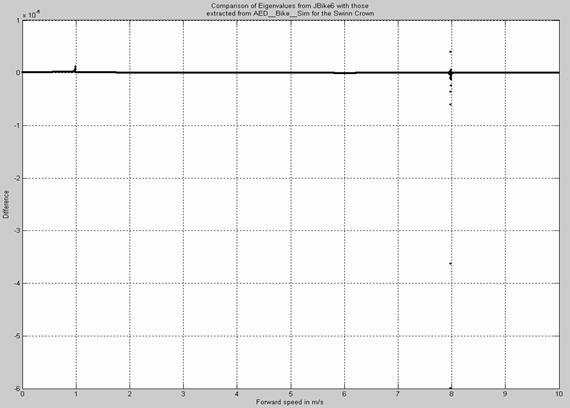 In all other cases, the difference between eigenvalues from the two different methods remains less than 6e-08. The non-linear equations of motion are confirmed. Investigate and eliminate spike in difference between eigenvalues from linearized and non-linear equations when velocity is near 8 m/s. Investigate generating more accurate eigenvalues from non-linear model with more accurate derivatives. Andy Ruina, Professor of Theoretical and Applied Mechanics at Cornell University, chief of the The Biorobotics and Locomotion Lab, and my advisor. Arend Schwab, Assistant Professor in Applied Mechanics at of Delft University of Technology and creator of TAM 674: Applied Multibody Dynamics, the class in which we derived the non-linear bicycle model and implemented it in MATLAB. Also co-author of JBike6. The rest of the Theoretical & Applied Mechanics Biorobotics and Locomotion Lab at Cornell University: Mario Gomes, Dave Cabrera, Manoj Srinivasan, and Sam Walcott. Fellow T & AM graduate student Geoff Recktenwald. Here are some video clips of the animated simulation confirmed by JBike6.
 ] 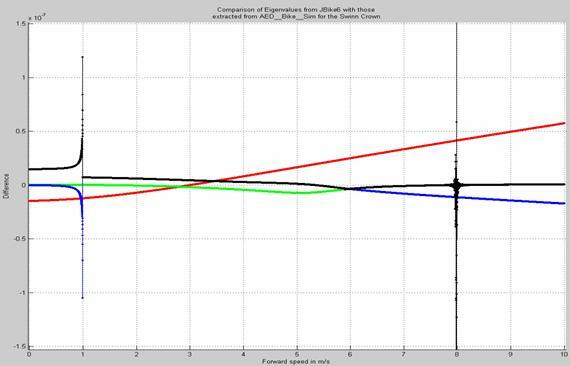 Benchmark Results on the Linearized Equations of Motion of an Uncontrolled Bicycle, 2004, A. L. Schwab, J. P. Meijaard, and J. M. Papadopoulos, page 1. Hand Masters Thesis, Cornell, 1988, page 23.